The full rulebooks for Gale Force Nine’s Star Trek: Ascendancy expansions are now available for download. "We’ve been monitoring your progress toward warp capability. When a society reaches your level of technology and is clearly about to initiate warp travel, we feel the time is right for first contact." A Planet may be convinced to join your civilization through diplomatic means by way of a Hegemony Roll. This roll represents the lengthy negotiations and treaties required to convince a world to join the larger galactic community or switch allegiances from one faction to another. Hegemony is the result of costly negotiations and normally requires spending at least two Culture Tokens to accomplish; one to make the attempt and another to place a Control Node on the planet if the attempt was successful. The Hegemony Resistance of a System is equal to the number of structures on the world plus the Ascendancy of the civilization who Controls it. Starbases and Nodes count as structures and each add to the Planet’s Hegemony Resistance. To attempt Cultural Hegemony, a player must Exhaust a Command Token and spend a Culture Token. The player then rolls a die and adds their current Ascendancy as well as any applicable Advancement bonuses. If the player rolls more than the target number, they may spend another Culture Token to place a Control Node on the planet, taking control of the world. If they fail the roll, negotiations breakdown and another attempt must be made later to bring the planet into the fold. While challenging, adding worlds to a civilization through Hegemony means that they contribute to it’s growth immediately without spending additional resources. When a Level 1, 2 or 3 Warp-Capable Civilization is discovered, the Exploration card will direct the player to develop some that System’s Capacity and place a number of Warp Tokens on the System. This is an independent, space-faring civilization that must be conquered or convinced to join a player’s faction. A Level One Civilization has a Weapons Hit Roll of 5+, a Shields Modifier of 1 in Planetary Invasions, and a base Hegemony Resistance of 1. A Level Two Civilization has a Weapons Hit Roll of 4+, a Shields Modifier of 2, and a base Hegemony Resistance of 2. A Level Three Civilization has a Weapons Hit Roll of 3+, a Shields Modifier of 3, and a base Hegemony Resistance of 3. A Level Three Warp-Capable World is a significant presence in the Galaxy that fledgling civilizations may not be able to deal with right away. Next week we’ll post the entire Star Trek: Ascendancy rulebook for download. Star Trek: Ascendancy is making its debut at Gen Con 2016 and Star Trek Convention Las Vegas. The game will be on stores shelves soon after! Remember, specially marked boxes of Star Trek: Ascendancy, contain the special limited set of 50th Anniversary Exploration Cards, inspired by the Original Series. There is more to come too! Look for info on the Cardassian Union and Ferengi Alliance player expansions later this summer and information about other player accessories later this year! A Command may be Exhausted to initiate a Space Battle with rival Starships in a single Adjacent Sector, or in a single Sector occupied by rival vessels. If a player has Ships in more than one Adjacent Sector, all of those vessels may participate in the Battle when the Command is Exhausted. 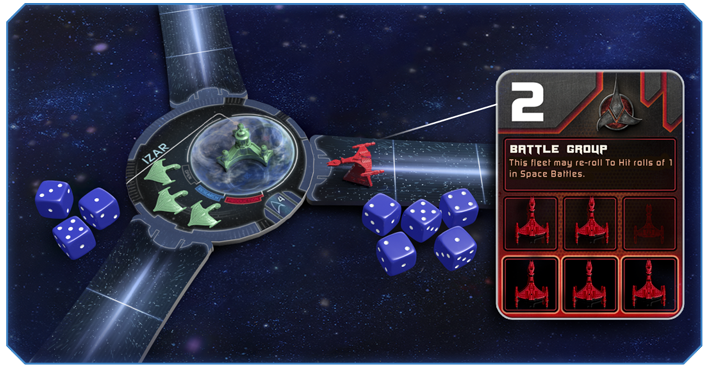 A Space Battle consists of a number of Rounds of Combat in which both players roll to Score Hits, take Casualties, and then decide whether to Retreat of keep fighting. The player who initiates the battle is the Attacker. Combat in Star Trek: Ascendancy is very simple. Both players involved roll a number of dice equal to the number of Starships involved in the Battle. On each player’s Control Console, the Weapons System slider will point at the number a player needs to roll to hit in order to destroy a rival vessel. An opponent’s Shields can modify that number, making the “Hit Roll” more difficult. Every Hit destroys a rival Ship. Both players Roll to Hit and then Take Casualties simultaneously. If there is a choice of where casualties are going to be taken, the player who inflicted the Hits chooses how to allocate the Hits. For instance, if a player is facing both a Fleet and individual vessels, the Fleet may be targeted in an attempt to break it up (remember, normally a Fleet must contain at least three Ships). Starbases may lend support to a Space Battle. When a civilization has Ships in Orbit of a System they Control that contains a Starbase, that player may roll an additional to Hit die in the Battle. Starbases may never be targeted or taken as a Causality and cannot fight on their own. After Taking Casualties, each side must decide to continue or retreat from Battle, starting with the Attacker. Retreats are made at Impulse Speed and via Existing Space Lanes. All of a players Ships must Move and end their Retreat in the same Sector. If rival Starships are blocking the Space Lanes, Retreat is impossible. Some Advancements grant Ships and/or Nodes (in a Planetary Invasion) a First Strike in the initial Round of Combat. In a Battle with a participant who has First Strike, that player rolls their To Hit dice first, forcing their opponent to Remove Casualties before rolling To Hit. If both sides have First Strike, than neither may use it in the Battle. When a player’s Ships Occupy a Developed System that they do not Control, a Command may be issued to Invade the Planet. A Planetary Invasion works much the same as Space Combat, except the invading Ships roll off against the structures built on the planet. Starbases do not participate in Planetary Invasions. The weapon and shield levels on the Control Console apply to a civilization’s Nodes as well as their Starships. Every hit by a Defending Mode destroys one of the Attacker’s Ships. The goal of the Attacker is to take Control of the Planet, ideally with minimal damage to its infrastructure. Hits by the Attacker don’t necessarily destroy Nodes, but the number of Hits does determine the results of the Invasion. If the Attacker rolls more hits than the Defending Planet has structures, then the Attackers take the world intact; taking over the existing Resource Nodes for themselves and placing their own Control Node on the System. If the Attacker rolls Hits less than the number of Nodes on the Planet, the Attacker must choose that number of Resource Nodes to be destroyed. If the Attacker rolls a number of Hits equal to the number of Nodes on the Planet, the surface of the world is completely razed during the Invasion and the System will need to be colonized anew in a future turn. Only the Attacker may retreat from a Planetary Invasion. The Defender may elect to Surrender the world to the Attacker. The Defender may even Surrender the world before the Invasion begins, preventing a conflict and turning over Control of the Planet and its infrastructure to the Attacker. Starbases are too valuable to destroy. Once a Starbase has been placed in a System, it remains there for the remainder of the game. When Control of a System changes hands, Control of the Starbase does too. The controlling player takes one Command Token from the former owner and places it face down with their own Commands, to be refreshed at the end of the turn. In this way, a civilization may Control more that the three Starbases they are allotted to commission. Will your Fleets be victorious in Battle? 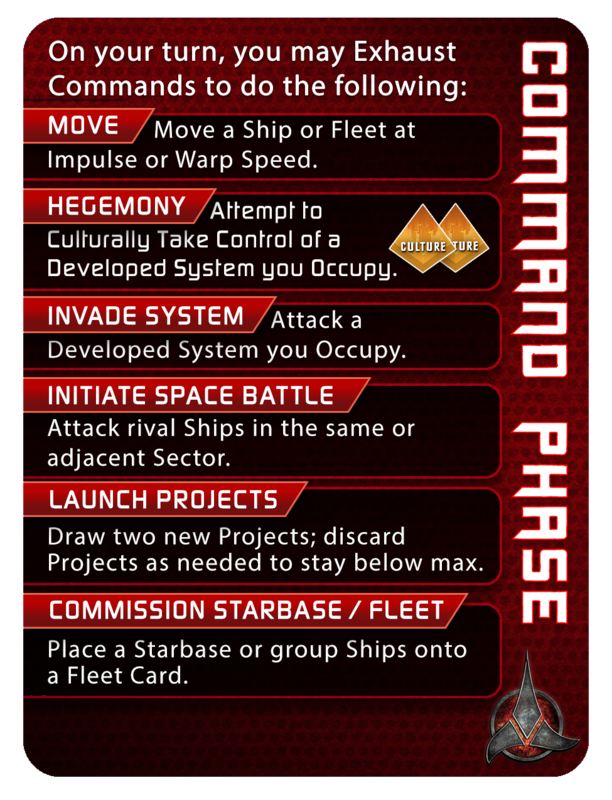 Tale command when Star Trek: Ascendancy hits stores later this summer. Next week, diplomacy prevails where combat fails as we look at adding worlds to your civilization through Hegemony and diplomacy. One Command can be issued to Move a single Starship or an entire Fleet. There are two types of Movement in the game, Impulse Speed and Warp Speed. All Starships have a base Impulse Speed of 2, by issuing one Command a Ship or Fleet and move up to two Sectors. Each space on a Space Lane is one Sector; additionally each System Disc also counts as one Sector for the purposes of movement. Impulse Speed is slow and cautious, and if travelling only a short distance, Command efficient. Warp Speed permits a vessel to cover vast distances in a short amount of time. In the game, when a Ship is commanded to go to Warp Speed, the Ship is moved just off the Sector it currently occupies and placed on the table next to the cardboard map section. A Warp Token is placed next to the Ship, pointing at the Sector in which it went to Warp. At the end of each game round a Ship is at Warp, another Warp Token is placed next to the plastic Ship. Additional Warp Tokens may be placed next to the Ship by issuing a Command. When a Ship is ready to come out of Warp, another Command must be issued. Upon Exiting Warp, the Ship may be moved a number of Systems (both Planetary Systems and Interstellar Phenomena) equal to the number of Warp Tokens next to the Ship in addition to the number of Warp Tokens pictured on completed, active Advancement Cards. A Ship may elect to move through fewer Systems and drop out of Warp earlier than the number of Warp Tokens permits. Ships at Warp that do not stop in Hazardous Systems do not have to make a Hazard roll, they bypass the System without incident. Exploring a new System and adding it to the Galactic Map will always end a Ship’s Movement. A Starship may enter a new System as part of its movement. When moving, Ships may not normally pass through a Sector controlled by another civilization when it is occupied by a hostile rival vessel. If trade relations have been established with that rival, they may allow the Ship to pass through their space at their discretion. If a Ship is denied passage, it cannot reverse course and “take back” the movement it spent to reach the rival vessel, it must end its movement in the previous sector, facing off against the rival Ship. Where will you chart your course when you take Command in Star Trek: Ascendancy? Next week, prepare to raise shields and go to red alert as we look at Space Combat in the game. Chart the course of the Galaxy’s great civilizations and empires with Gale Force Nine’s Star Trek: Ascendancy hobby boardgame. Send single Starships on missions of exploration or command vast fleets to seize alien worlds. Commission new Starbases on the edges of the galactic frontier or open diplomatic talks with potential allies. The choices you make will ultimately lead your civilization to prosperity or ruin. In the Command Phase of the game, players will make the critical decisions to grow their civilization. Each player has a number of Command Tokens they can Exhaust each turn to perform actions. 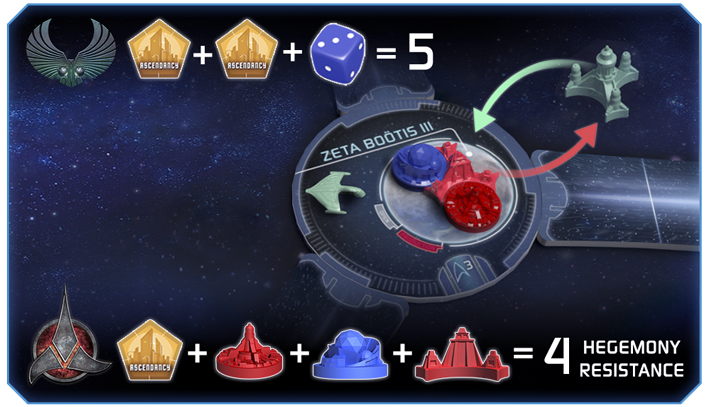 Players begin the game with five Command Tokens and will have the opportunity to earn more through Advancement research and the establishment of Starbases. The more tokens a player has, the more Commands they can issue on their turn. Every Command costs one Command Token to execute and the same Command may be given multiple times in a turn. A Command may be spent to Launch New Advancement Projects. 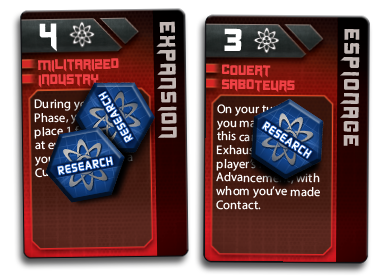 A player may draw two cards from the Advancement Deck and add them to their Research Area. The number of blue Research Nodes they control on their worlds is the maximum number of Active Projects they may have in their Research Area. Any Projects a player discards are returned to the bottom of the Advancement Deck. Research is committed to Advancement Projects in the Building Phase. A Command is also issued to Commission a Starbase. A Starbase is a major strategic construction; a civilization may only place three Starbases over the course of the game. Each Starbase a player Controls increases the number of Command Tokens in their pool, there is no limit to the number of Starbases a player may Control. New Starships may be constructed at a Starbase, allowing a player to build up their forces far from the civilization’s homeworld. Starbases can also contribute during a space battle in the system they are located in. A Command may be spent to Commission a Fleet. Fleets may only ever be formed at a civilization’s homeworld or at a Starbase under their control. Ships in a Fleet act as one, only one Command is issued to move a fleet for example. And many Fleets have a special purpose, represented by a Special Rule for the Fleet while it is active. Advancements, Starbases and Fleets are valuable tools to grow a player’s civilization. What will be your orders when you take command Star Trek: Ascendancy? Once our engineers finish cleaning the plasma conduits, we’ll take a look at issuing a Move Command and how Impulse and Warp Speed work in the game. During the Building Phase, a civilization may Commit Research to Advancement Projects as well improve Shields and Weapons Systems. The amount of Research to finish a project is listed in the upper left of each Advancement Card. A faction may add one Research Token to each Advancement Project per turn. A Research Token claimed from Interstellar Phenomena may be immediately added to an Advancement Project during the Command Phase or stored for use on a subsequent Building Phase. Once a Research Token is committed to a Project, it can not be moved. When an Advancement Project is completed, it immediately moves from the Projects area to the Advancements area. If applicable, a player may use the Advancement’s Special Rule immediately. Unless a card states otherwise, a player may only use Advancements on their turn. A faction may only have a number of active Research Projects equal to the number of Research Nodes it controls. If at any point in the game, a player has more Active Projects than Research Nodes, then Projects and the Research Tokens committed to them must be discarded until that is no longer the case. In addition, if a another civilization captures a player’s Research Node intact during a Planetary Invasion, then the player must chose one of their Active Projects, discard all the research Tokens committed to it, and hand their Project over to the conquering civilization to develop as their own. Now a rival player will be able to develop a new Advancement for their civilization that they normally wouldn’t have access to! Adding new Projects to Research is performed during the Command Phase. Some Advancements picture a Warp Token in the lower right corner of the cards. When completed, these Advancements increase the Warp Speed of a civilization’s Starships. Many Advancements found in the Federation deck provide additional safeguards while exploring the depths of space and improve their chances to make impactful discoveries. Other Advancements may picture a Command Token in the lower right corner. When completed, these Advancements immediately increase the number of a player’s Command Tokens by one. The new Command Token comes into play Exhausted and will be refreshed and ready for the player’s use during the next Recharge Stage. Klingons are almost single-minded in the pursuit of improving their military prowess. The Romulan Star Empire has a unique Advancement Deck with many cards a picturing a Culture Token in the lower right corner of the cards. When completed, these Advancements immediately reward the Romulans a Culture Token. Losing one of these valuable Advancement Projects to a rival is a devastating loss. The scientific acumen of the Romulans is dedicated to defending the Empire’s territories from encroachment. The Research required to upgrade Shields and Weapons is listed directly across from their current effectiveness on the Command Console. Unlike Advancement Projects, upgrading Shields and Weapons is a single, one-time cost that must be paid in full to improve the technology. Typically, Weapons and Shields may only ever be improved during the Building Phase. After a player completes their Building Phase, their Command Phase begins. Once a civilization starts the Command Phase, it may not spend any Resources to Build. Next week, we’ll review the Commands a player can issue during their turn. Make it so! ““What’s all this poppycock about lifeforms on this planet, Spock? As you explore and expand the Galaxy in Star Trek: Ascendancy, you’ll build your own Galactic Map by drawing random System Discs and connecting them to each other with Space Lanes. There are two types of Systems, Planetary Systems and Interstellar Phenomena. Planetary Systems contain planets ripe for exploration and colonization. Interstellar Phenomena are hazardous locations that hold a wealth of scientific knowledge. Many systems can contain navigation perils which can threaten starships or treacherous environments which may endanger crews. These Hazardous Systems are indicated by the Red Alert Warning at the top of the disc. When a Starship or Fleet enters a Hazardous System, a die is rolled for each ship. If the number rolled is equal to or higher than the Hazard level, a Ship is destroyed! Improving a Ship’s Shields modifies this number, protecting your vessels from danger. Ships only have to make a Hazard roll when they end their movement in a Hazardous System; thus Ships in orbit of Hazardous Systems as well as Ships built in the System are safe and may depart the system without incident. All Interstellar Phenomena are hazardous, but if a Ship survives the Hazard, the player may claim a valuable Research Token from the system. Some phenomena, like the Murasaki 312 formation, are minor hazards, while others, like a Neutron Star, are quite deadly! At the end of each game round a new Research Token is placed in the phenomena, waiting for another brave crew to claim it. While a Ship may safely occupy an Interstellar Phenomenon, Commanding a vessel to conduct further study in order to claim the Research Token will require a Hazard roll. Planetary Systems are valuable resources for an expanding civilization. Worlds found in these systems can be colonized and their resources can be developed to fuel your society’s growth. All planets may be colonized, but different planets have different levels of resources that can be developed, making some systems, like the resource-rich Terra Nova, more lucrative than others. Colored tabs on the System Disc indicate a planet’s Capacity and determine if players can place Production, Research, or Culture Nodes on the world. Some planets even contain an open Capacity where a player may construct any Node they see fit. Each player’s turn begins with a Building Phase. All activity in the Building Phase must be competed before moving onto the Command Phase of the turn. During the Building Phase, civilizations will expend their resources to construct Starships, Colonies, and Infrastructure. They’ll also conduct research to improve Ship Weapons and Shield Systems and further development of Advancement projects. All of these tasks may be completed in any order during the Building Phase. Starships may only be built at the player's Home System or at a Starbase they control. A commander who constructs three or more Ships at the same location may immediately form those vessels into a Fleet without having to expend a Command in the Command Phase. These ships are ready-built to the specific mission of the Fleet. A civilization may build a Colony in an Undeveloped System they Occupy. An Undeveloped System is a Planetary System that does not contain any Nodes. In order to construct a fully functioning Colony on an undeveloped world, a player must spend a Culture Token and discard one Starship located at the System. A Control Node is placed on the System Disc, placing the System under the player's Control. Resource Nodes allow a society to gather valuable resources from their worlds; extracting raw materials, conducting cutting-edge research and enriching their society. A System may only support the amount and type of Resource Nodes indicated by its Capacity. Resource Nodes may only be Built in Systems the civilization Controls, so during a Building Phase, they must construct a Control Node before any Resource Nodes if they don’t already have an established Colony on the planet. Each Resource Node will generate the appropriate Resource Token at the end of Game Round during the Recharge Stage. How will your civilization take shape, when you take command in Star Trek: Ascendancy? Next week, we’ll scan the Exploration Deck and investigate the strange encounters, fascinating discoveries and challenging obstacles facing your Starships with each new Planetary System they explore.